Thanks To Everyone Who Made This A Huge Success! Inspiring Latino Students Who Are Seeking The College Dream, A Successful Future, & To Inspire Others! We are giving away up to $3000 each towards tuition to a college or university. Check back soon for the 2018 application. We are a non-for-profit organization that was formed with the intentions of helping students seeking college education. The board consists of Sandra Sanchez, Lourdes Duran, Jenny DiSapip, Steve Kopp and Israel Sanchez. To ensure the legacy of Cesar Castellanos carries on! He made things better for so many people, including his family, and this will never be forgotten. Cesar came to the U.S. with a dream to provide his family with better opportunities. Along the way a restaurant was born, and through this restaurant he was able to put his family through school. Long hours, dedication, and a hard work ethic made it possible for his three children to attend DePaul University. In 2014 Cesar passed away and although he is no longer present, his family wanted his legacy to live on. 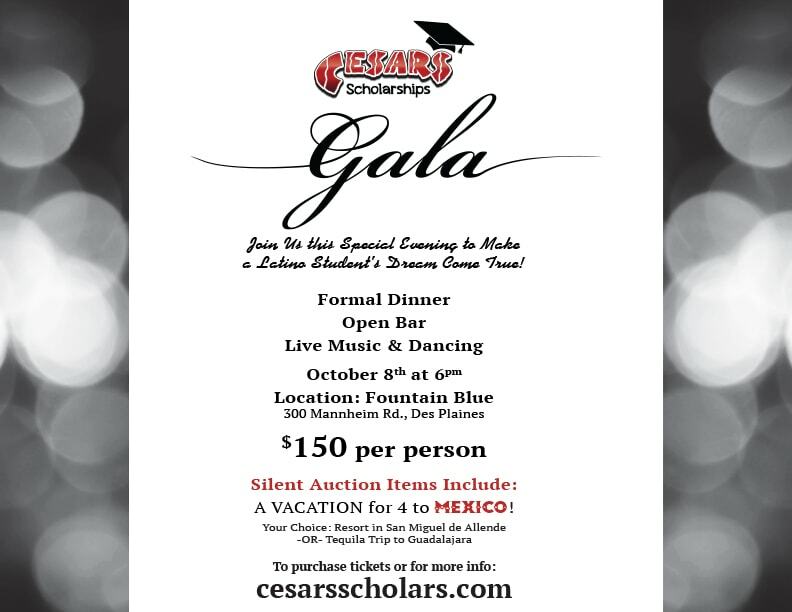 The Cesars Scholarship Foundation was created to financially help students seeking the college dream. The application process consists of a 250 word essay describing their desire to continue their education. There is also an interview process that will take place, which will help prepare applicants for “real life” situations. Must have a high school diploma or GED equivalent with a minimum GPA of 3.0 at the time of graduation. You must be accepted to the college or university that you plan on attending by the time the scholarship is awarded. You must be of Latino heritage AND live within the Chicago city limits. You must have participated in extracurricular activities while in high school. You must have been, or be currently involved in community service. Your household income must be below $50,000 a year. Winners Will Be Announced April 30, 2017. Good Luck! I knew Cesar since I was 20 years old and have know Israel that long as well. I wanted to tell everyone how great this is to see this scholarship fund in Cesar's name. When I was young I lived above the bar and worked at the Starbucks at Clark and Belmont, and Cesar helped me with many things. He would feed me, he would close the bar and talk to me about life late into the night, about struggles, about hard work, about getting fired from his first job in America and how that made him feel. He gave me a job for a while to help get me going in right direction. He was a true mentor to me at that time. When he moved to West Town I was living there as well and I got to see him and his dogs walking and we got to catch up on things every once in a while. As I have grown older I have a wife and two daughters, I often tell stories about Cesar and how important it was to have him helping me in my life at that time, and I was extremely saddened to hear of his passing. Seeing of this scholarship brings back many of Cesar's teachings to me. Thank you very much for putting this together. It's great to see a local business giving back to the same community they've prospered from. I've dreamed of going to college since I was a little girl. Thanks to Cesar's Scholarship Fund I'm one step closer to making that dream come true!